We spent the night on a remote cliff ledge with a great view of Nine Mile Canyon to the south. The wind was strong all night, but because we oriented Thor's nose into the wind, the impact on the camper was minimal. There were some strong gusts but the noise was the only way to tell it was blowing. By the next morning, most of the clouds had moved on. It was still windy, but bearable. Our plan was to continue down Sandy Wash to the Green River raft put-in site and look around. From there, go west, then north into the Vernal, UT area and reassess our near-term plans. The photo above should have been in the previous set; it shows the interesting lighting on the cliffs as the sun briefly shone through. 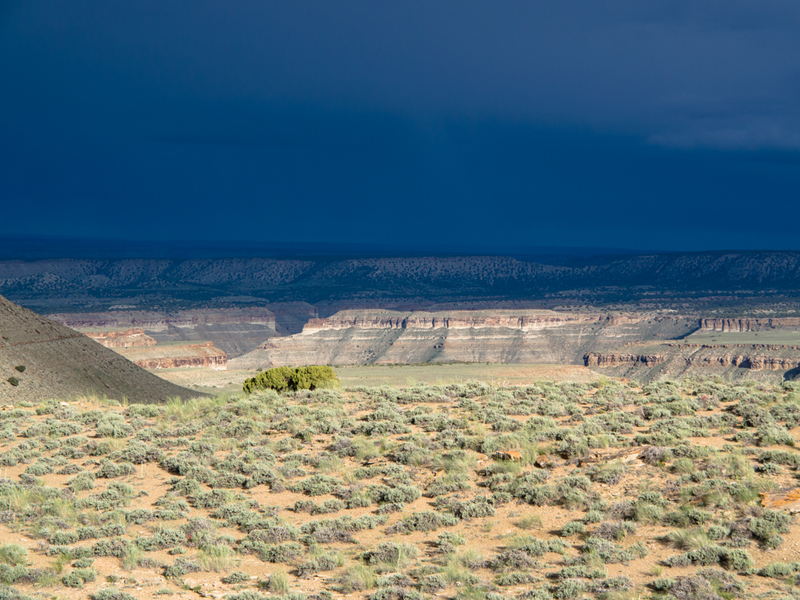 This view is looking to the southeast from our cliff camp. Nine Mile Canyon is in the inner gorge of the canyon you can see above. Before we left the area, we drove back to the cliff overlook. A side canyon of Nine Mile was now clearly visible in the morning light. There was an extensive line of cliffs to the north of the trail that went on for many miles. 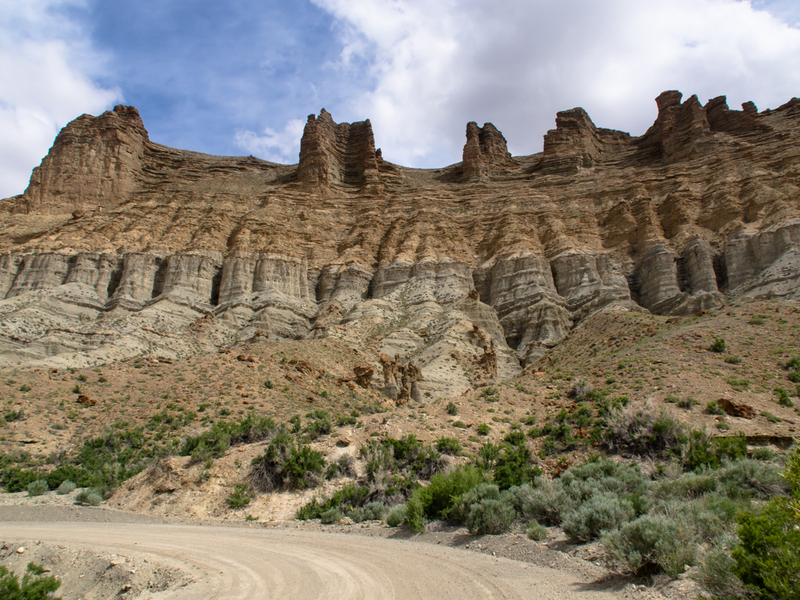 Closer to the Green River, the erosion resulted in interesting mud palisades. 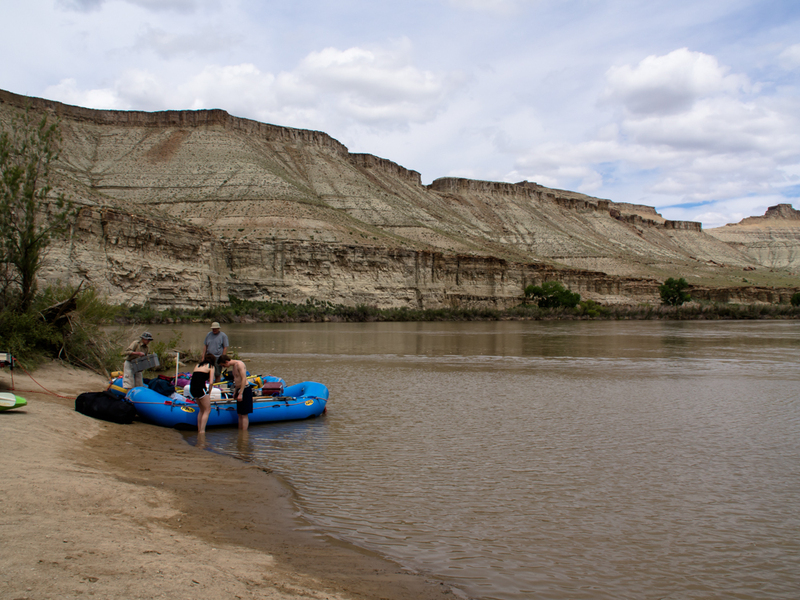 The Sandy Wash trail was one of the primary access points to the Green River raft put-in. There was a BLM ranger station there so the trail was in pretty good shape. 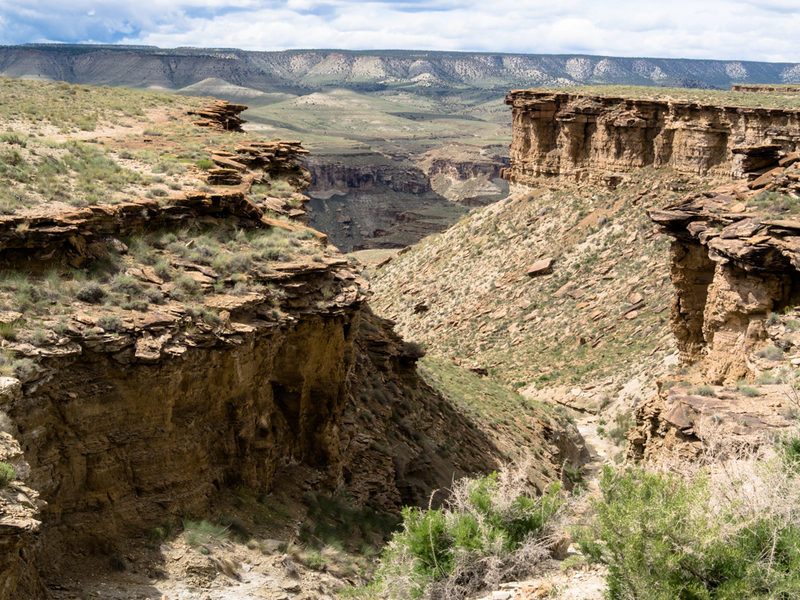 The trail followed the contours of the cliffs and skirted every side canyon resulting in a set of switchbacks without any elevation gain. 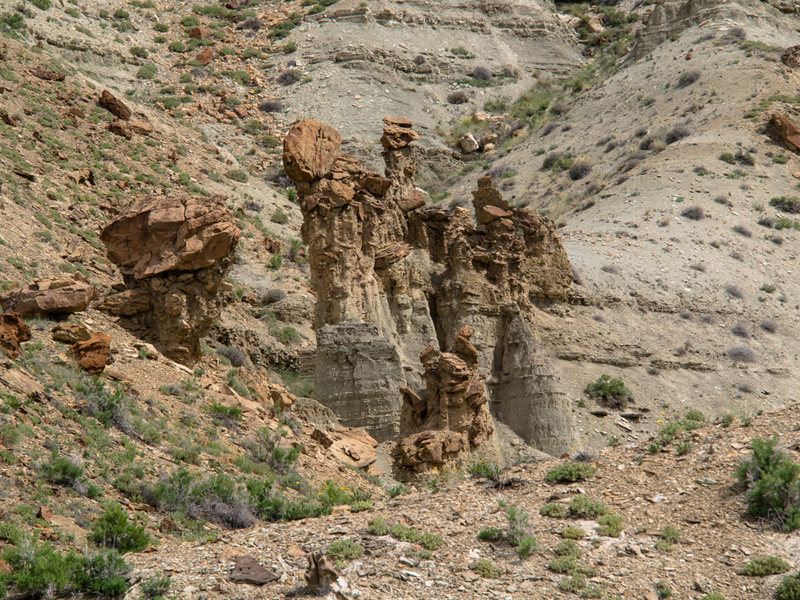 Erosion on the cliffs had produced hoodoos from the harder cap rock. Close to the road there were a set of balanced rocks produced by hard cap rock that had fallen and then served as a cap for a different layer of softer material. We had to skirt each side canyon. Some of the side canyons were quite substantial. 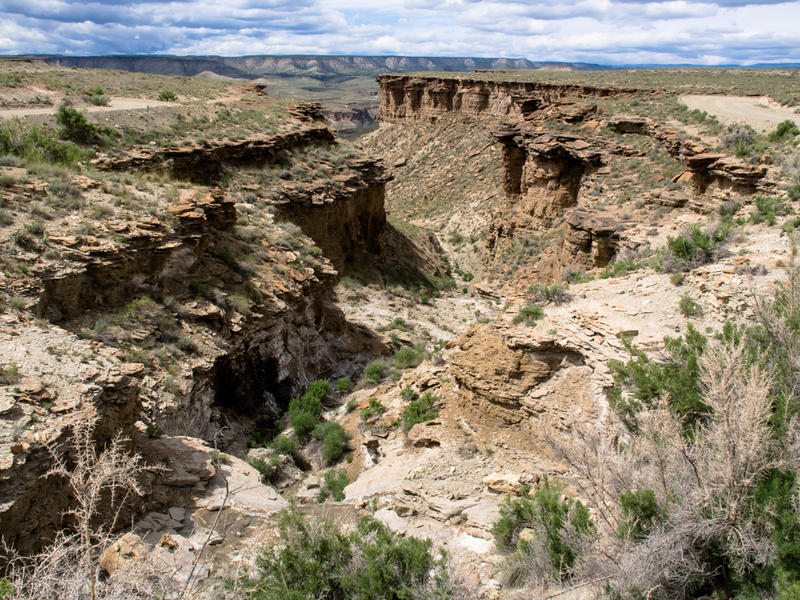 These canyons eventually emptied into Nine Mile Canyon to the south. 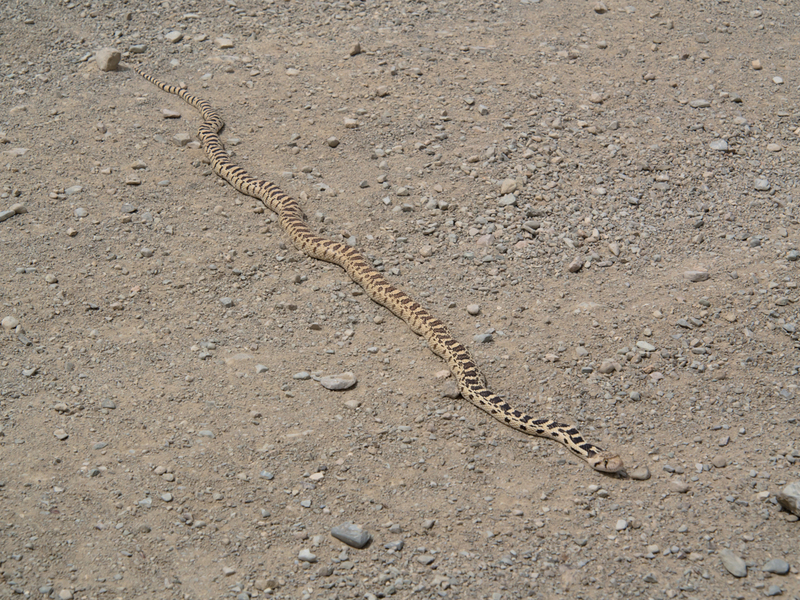 We motored on at a good rate and I spotted this fellow sunning himself in the middle of the road. I drove around him and perhaps because the ambient temperature was in the mid-50s, he was unable to move at any reasonable pace. 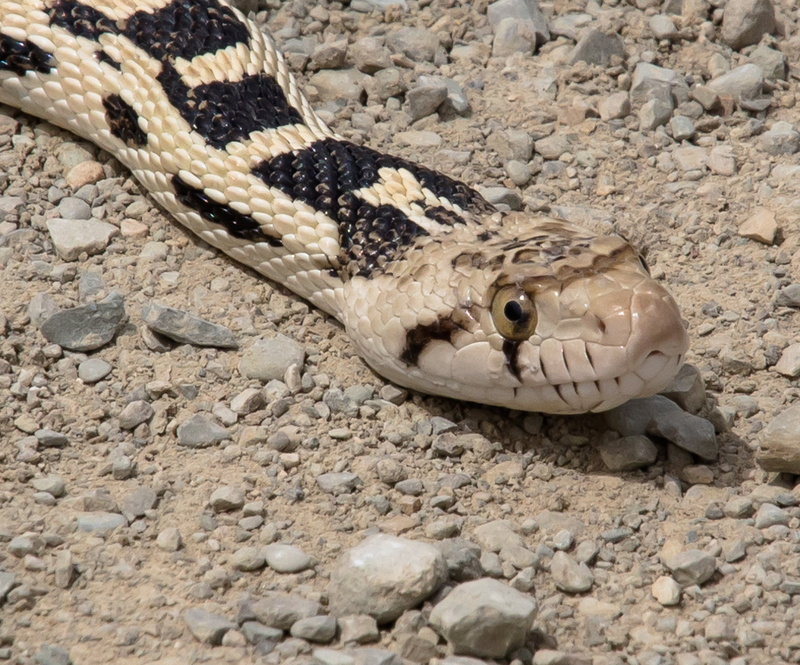 This fellow is not a rattlesnake but rather a non-venomous species like a Bull Snake. It is interesting that the stripes on his head are also continued in the pigment of his eye. 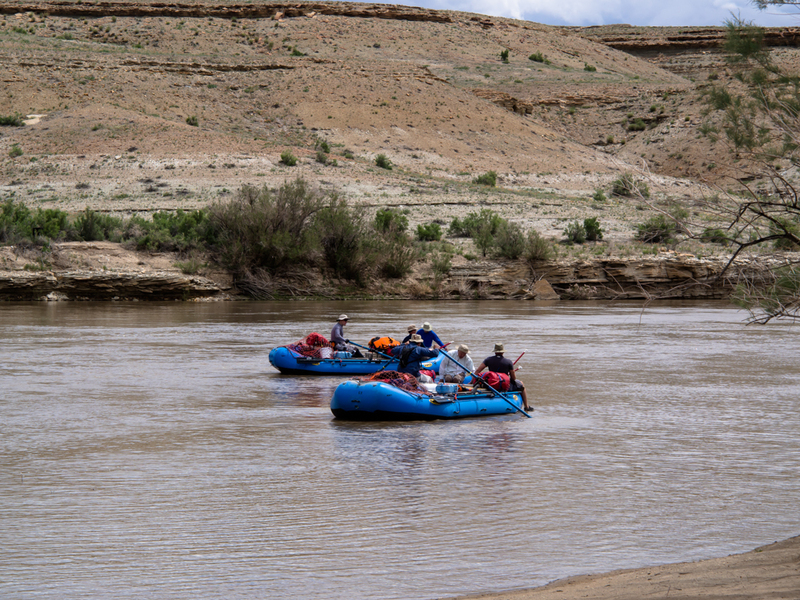 We got to the Sandy Wash put-in just in time to see several rafts launch on a multi-day trip down the Green River. The BLM ranger was watching and he and I talked for quite awhile. Interesting fellow; he lives at the site for 3 days a week and switches off with 2 other fellows. Another group prepares to depart. The water in the river is in the high 40's so the gal in the swim suit is going to freeze her girly bits right off. A wet suit, not a swim suit, would be more appropriate attire given the conditions. The way things were "back in the day". 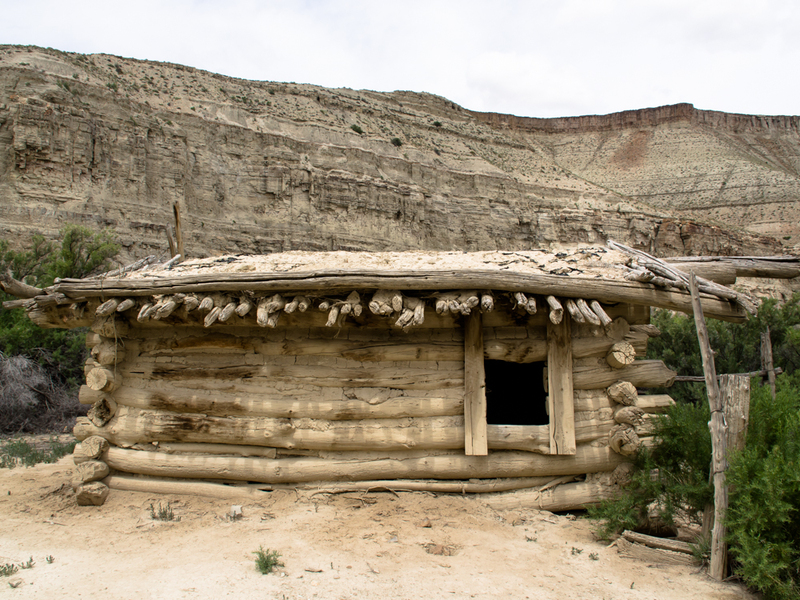 Hand hewn logs (likely fished from the river) were chinked with clay-based mud to provide the basic construction technique. 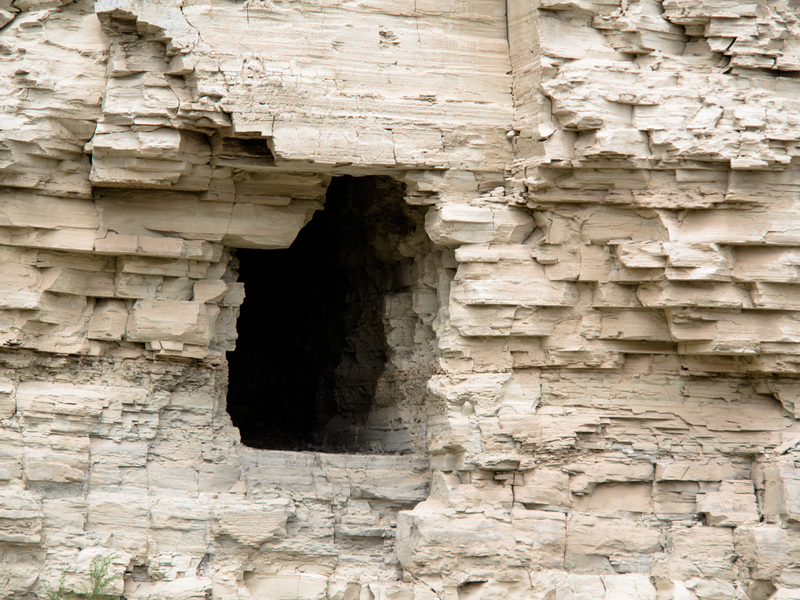 On our exit from the Sand Wash put-in we noticed what appears to be a tunnel cut in the cliff wall. 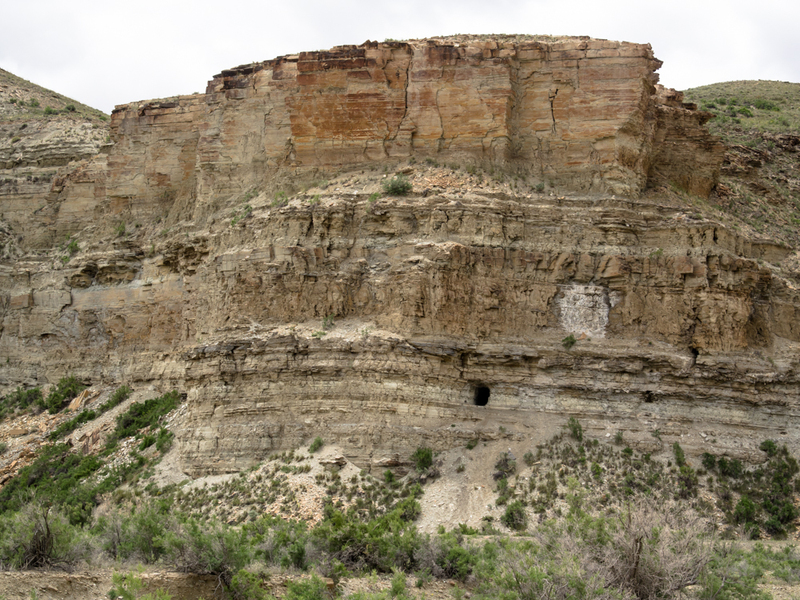 There was another entrance on the opposite wall of the canyon. A bit further up the canyon, we could see a number of tunnel entrances. 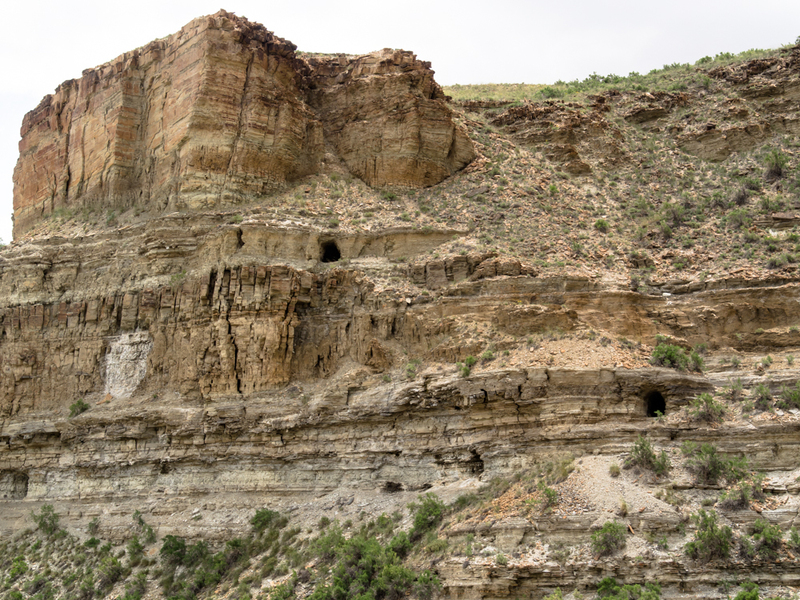 Given that the sandstone and shale in this area is not typically "interesting" in an economic sense, I am guessing that these were test tunnels that were looking for uranium. Uranium was in fact found in these strata, but in other locations. 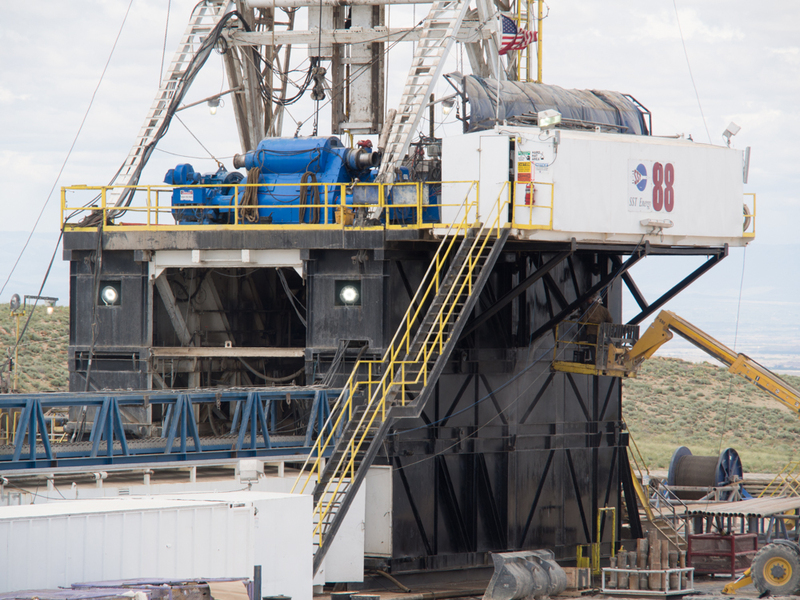 We drove another 30 miles until we came to this drill rig. 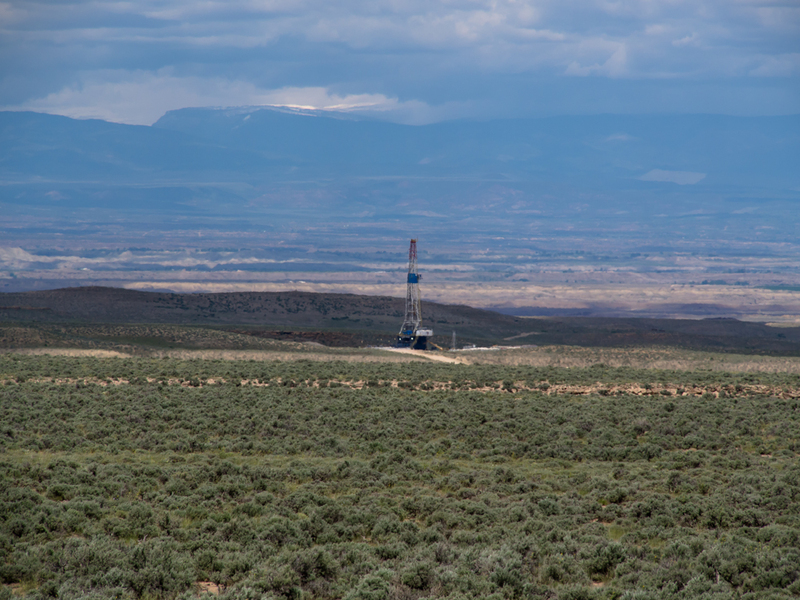 This area is known to produce both gas and oil. In the distance is the High Unita range with peaks over 14,000 feet. This rig was quite good sized. You can see the workmen in the parking lot for a size comparison. The tree trailers in the bottom left are the power plant for the rig. The blue machine appears to be a hoist or winch of some kind. Note the capstans on the ends. The further north we drove, the thicker the construction traffic. 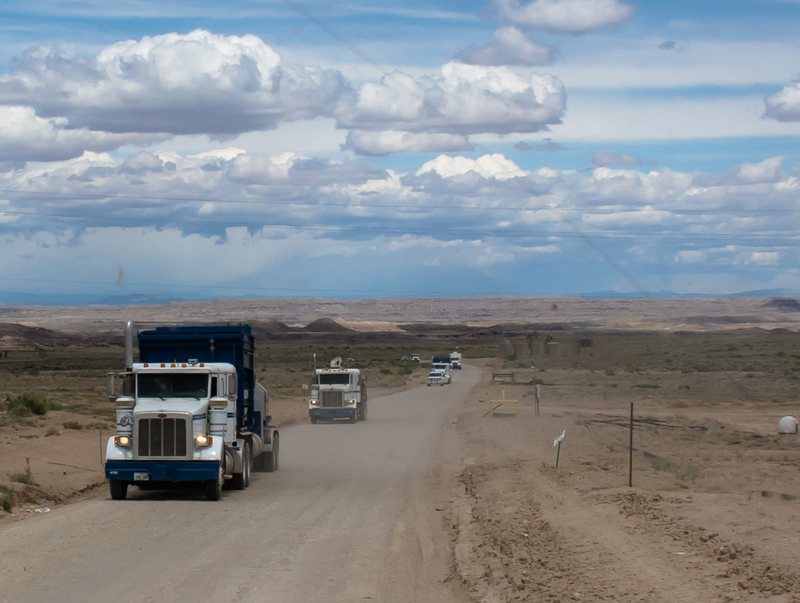 Then we met this convoy of Baker-Hughes trucks bringing in the components of another drill rig to be assembled on-site somewhere back in the hills. There were about 30 trucks in the convoy. At the junction of Sandy Wash trail with the blacktop, we were stuck in a huge traffic jam as part of road construction. We waited for perhaps 20 minutes to move. Then we headed east on US191. 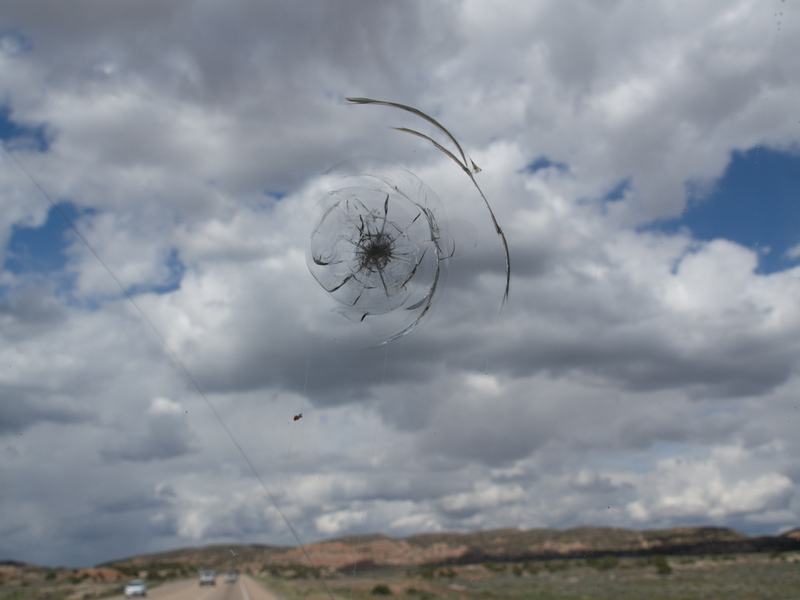 We were happily driving along US191 and a rock from an oncoming semi hit us on the passenger side windshield leaving a nice souvenir of our journey. We hit Vernal, UT and headed into the Smith's grocery for supplies when we spotted this prime specimen. As the old joke goes, "She had more chins than a Chinese phone book". It was getting late and the dinner preparations would take the better part of 2 hours, so we sought a quick, easy place to camp. We chose Red Fleet State Park about 10 miles north of Vernal. 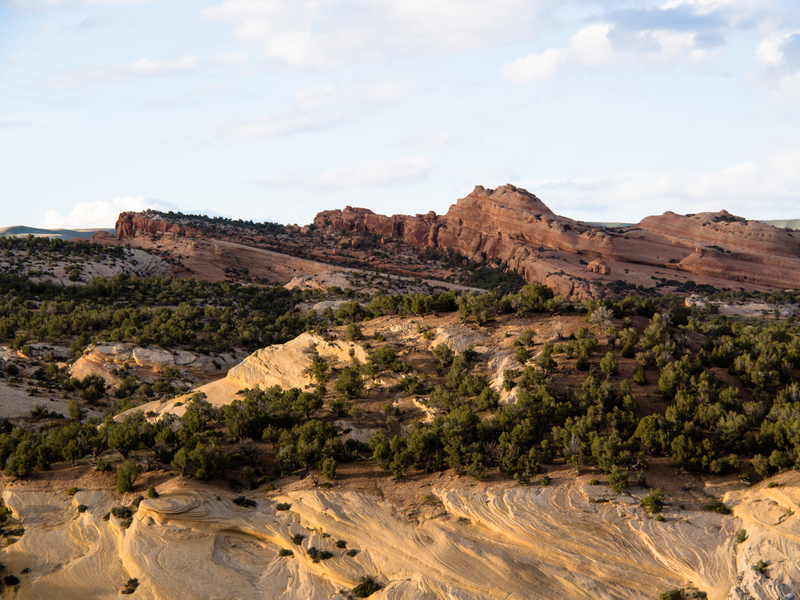 From our camp, we had a nice view of the sandstone cliffs to the north. 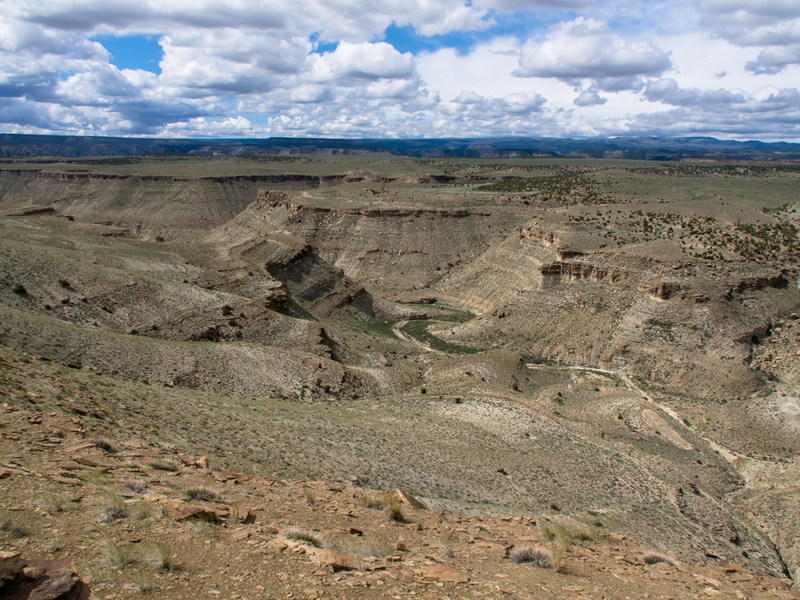 The Nine Mile Canyon area is worth visiting. 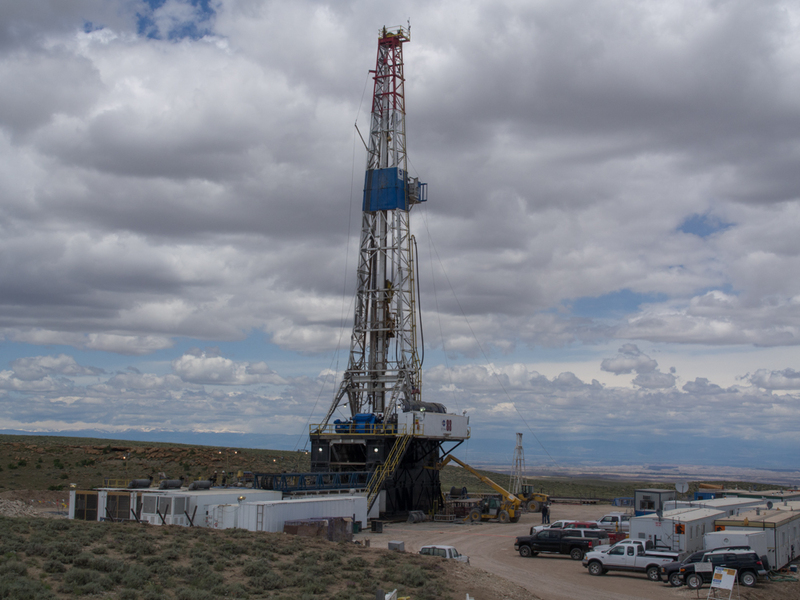 There are some remote areas, but the roads were in good shape due to the oil/gas exploration. If you go to this area and are so inclined, get one of the local outfitters to arrange a float trip on the Green River. A raft trip provides a easy way to see some of this beautiful and remote territory. 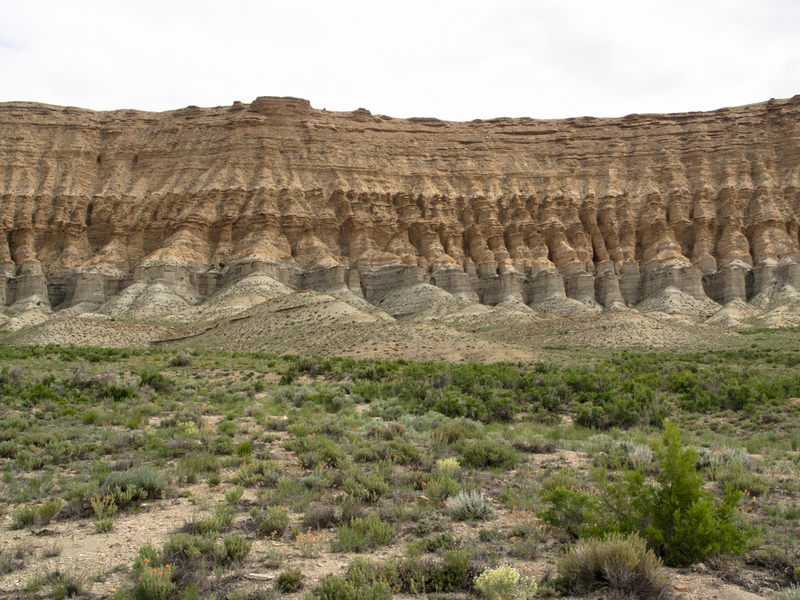 Tomorrow, we are planning on continuing north Flaming Gorge, UT.